Killer Characters: Advice From Doc - Giveaway Alert! Advice From Doc - Giveaway Alert! Hey there... don't just skim to the end ta see what's being given away! I got something to say, and you'll want to hear it. Ha! You think I'm gonna say something boring, right? 'Cause I'm old? Well, listen up! I just told Merry Wynter she was a human catalyst. You know what a catalyst is, right? I looked it up in the dictionary to be sure I got the definition right - it's been a long long time since I been in school. A catalyst is defined as "a substance that increases the rate of a chemical reaction without itself undergoing any permanent chemical change." But right below that is another definition. The dictionary says, "a person or thing that precipitates an event." Well, since Merry got to Autumn Vale a year ago or so, she's been precipitatin' all kind of events! Yeah, some crap happened that wasn't good, but in those cases things were gonna go south anyway. Just ask poor old Rusty Turner who was hidin' out in the woods scared o' Russian mobsters that weren't never gonna come and get him how he feels about Merry. Bah-hah-ha! He'll tell ya. 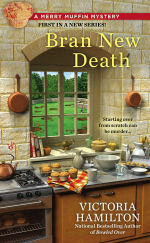 You'll hafta read a book called Bran New Death (Merry Muffin Mysteries Book 1) to find out about that one. Anyways, I read on the Internet (Yeah, I'm old, but I can still think, and Gogi Grace gave me a tutorial on using the internet; I like it 'cause she showed me how to make the print real big 'cause my eyesight's crap) about human catalysts, and it was fascinatin'! I had been thinking a lot about my town, Autumn Vale, and what was wrong with it, but then Merry Wynter came long. She asks questions, digs deep, really tries to figure things out. Things ain't perfect now, but it's gettin' better. Yeah, it is, despite the murders lately. Those ain't Merry's fault. Anyway, do you know anyone like that? Someone who changes things just by bein' themselves? If you do, I'd say, if they got a good heart, work with them, 'cause in truth, we humans are so stuck in our ways and we want things to stay the same, but they ain't gonna. So, work with the human catalysts in your life to make things better, to move forward, or a catalyst will come along to try an' make things worse. I'll bet you can all think of a human catalyst tryin' to make things worse. So... we all gotta move forward. As they say, lead, follow, or get the heck out of the way! Gotta go... I'm readin' a real good book right now, and don't wanna lose my place. 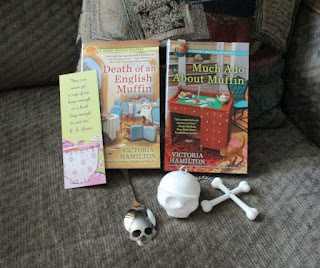 One copy each of Death of an English Muffin and Much Ado About Muffin, as well as a bookmark and cool skull tea steeper and teaspoon! 1 - Enter by Midnight, August 23rd. 2 - US and Canadian addresses welcome! 3 - Please leave a first name and email address; put the email address like this - yourname (at) yourserver (dot) com - to fool the spambots! I'm looking foward to reading this. I've enjoyed the earlier books in the series. Merry's bitter foe sounds promising as a character. I would love to read this. Thank you so much for the contest. I am old as well but not really. Loved the post. Thanks for the chance. How exciting, this a fantastic giveaway. I would love to read this book. I am loving the storyline. I have yet to read anything from this series but would love to. Have read the Vintage Kitchen series and loved it. So I know this series will be good, too. But have to tell you Victoria. The Della at deepotter at peoplepc dot com will not really fool a spambot. They can be made to identify that form as well. There was an article about what spambots are and how to defeat them and the writer said some other forms designed to defeat them have failed as well. It did mention one that had not yet been defeated. But don't remember what it was. It's like what my Dad said way back when. There is always a way out of the box. You just have to find it. That is a cryptanalysist for you. There is no such thing as secure. But one can keep trying. His thing was randomizing. I haven't read either one of the books. Thanks for the giveaway. What a great giveaway! These books sound great, I'm so looking forward to reading them. I've read all three books so far and would "kill" to win this giveaway. I own four books in the author's other series and everyone who has borrowed one has enjoyed them also. Yes I know a catalyst. My mother! Every where she went she was able to foment trouble just by walking into a room. Especially family gatherings. I love a good mystery. It would be nice to win. Your books are terrific! Thanks for the great giveaway. Karen. I haven't started this series yet, I would love to win. I'm an old lady that would enjoy reading this book, too. Thanks for the contest. This series sounds great, and I'm ready to start a new one! Thanks for the opportunity! This is a WONDERFUL giveaway!!! Great series, love the intricacy of the covers as well, and as usual a terrific giveaway! Thanks. Thanks for the chance at a great give-away.really love cozy mysteries. I'm really looking forward to reading this series. I have the first one waiting on my shelf. this one really looks good..
have yet to read this series. it sounds like fun! I loved the first book and can't wait to read the next. Love all of the characters! I would really like the chance to read this book. Thanks for the lovely giveaway. I haven't read any of your books so this would be a great opportunity to do so. I love this series. I am currently reading this one. So good. I admit I haven't read this series yet, but by reading the description, I can't wait. Thank you for the wonderful giveaway. I love the prizes! Doc sure hit the nail on the head! What a great series! Thanks for the chance to win! Great interview with Doc, he sounds like a real character! I haven't read this series yet and I'm definitely going to read now. What a great giveaway! Really cool gifts but the best thing is the books!!! I am a big Victoria Hamilton fan! Wonderful opportunity...thank you! Thank you for the opportunity to win such an awesome giveaway! Can't wait to read this! 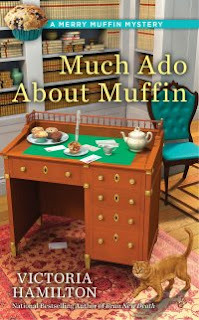 Much Ado About Muffin sounds great. Thank you for this chance. I've really enjoyed the earlier books in this series (and the recipes, just mad about muffins, you know! ),and have made sure my library has a copy on order. If I'm not the lucky soul to score in this giveaway, I'll be ordering a copy for me, too! kimmwrtr (at) yahoo (dot) com. Some of us older folks are getting pretty good at the computers. At least for what we want to do. Thanks for the opportunity. jluebke (At)frontier (Dot) com. I love the admonition to actually read the post :). Sounds like a fun group of characters which means I have another series to add to my TBR list. Thank you. I enjoy the information you share! Especially the books! Thank you!!! We have a winner, and I ma emailing her this morning. Thank you all so much for reading and participating! Thank you! Love a new series and author!